In America we have a very specific protection of freedom of speech. In recent times the youngest voices among adults have cried out to silence some people and that really could take us in a bad direction. If someone is racist, un-informed, just plain mean, or trolling they still have every right to say whatever they want to say. As long as a person commits no crime due to the inspirations of their thoughts and words we cannot and should not silence them however we all also have the freedom to say whatever we want back. Freedom of speech doesn’t protect anyone from disagreement and on the contrary it seems to be a means by which all voices can be heard. Still, everything has a breaking point. I for one have never believed in the steadfast rule often lobbed toward children that no matter what anyone says to you that you never resort to violence. I am not in any way advocating violence to solve arguments. Civility, while a hard concept to truly pin down without getting into a discussion on classes, is vital to problem solving. Arguments are disagreements on which things are a problem and which solutions best fix those problems. Such discussions should be conducted as calmly as possible and with all points of view entertained. This method is slow and that’s why people don’t want to do it. That and pride, as Americans we seem to be ever more infected with the idea of personal pride to such a point that entertaining another point of view becomes an affront to our quality of character. It is okay to be wrong though. It is okay to change your mind over time as you learn and change. So what violence do I entertain? Perhaps that of the abused. If someone else believes what I don’t it may bother me, but it isn’t truly affecting me. I can choose to walk away or to argue it out but there are other ways that people treat one another. Abuse is the use of overwhelming force to control someone. That force can be applied physically and it is more obvious or it can be applied verbally, socially, institutionally and financially. To say that no words should ever inspire violence is to suppose that words cannot dominate and overwhelm a person to control them. Words very much can. This happens in families, in work environments and in myriad other circumstances. In these cases it may be right to take up arms to win back your freedom and your sense of self from your oppressor though from the outside these scenarios are hard to judge, hard to write a law about. What does this all have to do with freedom of speech and censorship? The generation of people either lauded as amazing or hated as being vapid are millennials. These people are more in touch with open emotional expression than any in recent history and many would say this makes them oversensitive. Perhaps it does. A nation, like an individual, experiences growing pains as changes occur. When shifting away from being closed off emotionally it’s natural that we may swing too far toward knee jerk overreaction on the topics that have always been hard to approach, but now are not being ignored. I was inspired to start this writing on hearing the President talk in an interview about college students working to ban any remnants of reminders of people that ever were involved in slavery. Being less than 200 years removed from abolition it seems nearly impossible but the emotions stirred up in people are understandable. Still I offer another point of view that on this particular topic we need to never ever forget that the trade of human lives and the ownership of human being was real here. It continues to be real in other places in the world today. We cannot lose sight of the importance of not abusing one another in this most extreme way. Because of this I ask that you not see reminders of the unchangeable past as a symbol only of current oppression. Realize their value as a reminder of what we have done and what we are capable of doing wrong if we don’t work to be better. Educate everyone you can and listen to what people have to say to you. You will learn new things and hopefully you will spread good knowledge too but I hope we never decide that the right to any point of view, morally repugnant or not, isn’t vitally important to protect. With that lets hope for more discussion and dialogue and less sided-ness. A discussion started with a friend of mine recently in relation to the debate between Bill Nye and Ken Ham on the idea of creationism vs evolution. I’ve held my own thoughts for a long time on what we might call God but until this discussion I hadn’t tried to articulate it all fully. In chatting with him I think I’ve managed to say what mental manipulations it takes for me to embrace the concept, the idea of a God or of holiness. Some will say that my thoughts are anti religious and you’re welcome to that opinion. For me it’s just a theory and it’s one I’m still working on but I’m ready to talk to more people about it. Emotion matters. Emotion is real, as real as anything we can have in life. It’s a completely direct part of the experience of being human. Our emotions exist for reasons that have to do with our well being. Fire burns and feels bad because it damages our body and food tastes good because it supports us. Our emotions can be complex and even counterproductive but generally they come as a form of guidance built into us for self protection. It is easily possible for people to create god within our mind to make up for what we can’t otherwise deal with. Death, origin, disrespect, oppression and so many other bad experiences overload us emotionally and dealing with those issues we’ve exchanged many stories and ideas over time. It’s quite possible that such inventions are so old that we’ve adapted to them as part of our way of living and our connection to the divine is a connection to the other people we identify with allowing our mind to reward us with positive emotion. Communal belief feels good because we survive as a communal animal and loneliness hurts because we can’t survive as lone beings. I cannot disprove god and I don’t really want to but for my sanity after these theories occurred in my mind I have to redefine god as the community of human experience and collective well being. So for me God is another word for collective concern and identity in a community. God is, without us having to process it, a way to care for everyone and put the group first over ourselves. But that, to me, doesn’t make God exist as a thing. It doesn’t necessitate that god is real on it’s own outside of the existence of human thought. The old old question of “If a tree falls in the forest and no one is there to hear it does it make a sound?” is similar to what I have to call into question here. The most important part of my theory of God is the fact that it doesn’t matter if you think as I do about it. If you accept God at an emotional level then you are still participating in the same social dialog that I am identifying but in a more direct way. Because I have thought this way I can’t undo it. I am forced to go through the extra steps to think about how god is a construct of our collective existence as thinking beings, but the result is the same. People need community. People are community. In that way I want to go further into my theory of God and holiness to know what we as people need; what satisfies our want of collective worship and how to ensure that that fundamental want is not used to take us in destructive directions. Being poor does not mean that you waste your excess income, it means you don’t have income. Being poor is the lack of having any money to spend. I think the work done recently in the United States on the Affordable Care Act is very good and while anything that big is going to have problems in it, overall it’s an improvement for the country. That said it all ignores the poor with impunity. What is the reality? About 10,000 dollars a year or less, even nothing. That 10k comes to $27 a day including food and housing which would tend to leave 10 to 0 dollars over for personal freedom. What does this have to do with the Affordable Care Act? Well it’s expected that everyone must buy insurance or pay a fine for not having insurance. The goal of these rules is to spread the risk of medical problems over all of the population so that costs can be minimized for an individual. That all works for people with some money but what happens to people with no money? If I have $0 and my leg hurts constantly I can go to a free clinic (If there are any) or an emergency room where my non-deadly condition will be ignored. If I have no insurance then my visit to a doctor might cost $200. If I DID have insurance then my visit could cost just $50. But I have no money so either way I can’t afford it. Coverage itself is the same way, if I have no money I can’t buy any coverage and I can’t pay whatever fine might be laid on me for not having coverage because I have no money. So if I am poor I can get emergency room help if I am going to die without it, we have had laws on that for a long time now, but if I have pain or trouble moving or problems with my skin I can go to a place where people have the skills and tools to help me and be refused. The truly poor will get no benefit from having insurance or from the insurance industry being reformed. Am I wrong? Have I missed something? Tell me, I want to know. Our own perspective, our personal point of view of the world, is all we have. It flows from a nearly undeniable truth that René Descartes brought to the west in saying that our thoughts prove our personal existence ( The old “I think therefore I am” http://en.wikipedia.org/wiki/Cogito_ergo_sum ) Given that our thought defines our reality we can open up to the idea that we are able to change our personal reality by adjusting our thinking. I think this is very true but there is a big problem with putting this solution on a person. All of these realizations depend on a certain amount of luxury. It is known and true that people have maintained good attitudes through awful and destructive circumstances. People have successfully smiled and breathed with decided freedom in the midst of total oppression. They are rare but they demonstrate that we can change our experience by changing our perception of reality. Knowing that I must now take us down a different path. Depression, pain, anxiety; these are factors that can and will prevent people from being able to change their perspective. If I were to see a person being pulled out to sea in a riptide and facing the fear of drowning I could tell them that some people have developed meditation techniques that let them slow their metabolism and hold their breath much longer than normal. That would be dumb as hell. In times of depression we can’t see the forces surrounding someone and pulling them down. Offering advice is what we like to do, human beings are problem solvers and very very good ones but when a persons vision of reality is being swallowed up by fear or sadness they can’t see their potential for control. So what is the point of this knowledge? How can some people shape their own emotions and others not? Why bother trying to tell those who don’t believe that reality is subjective? Even though the barriers to changing your feelings can be overwhelming it doesn’t change the fact that the core idea is true. (The idea that our own point of view is our own reality and that we have control over that point of view and thus our reality.) It’s up to us all to know when sharing this philosophy is helpful and how to communicate it. A true undeniable part of the human condition is knowing that everyone is different. There are positive people and negative people. There are the chronically depressed and the happy go lucky AND the average ol’ human. All of us will experience highs and lows and despite our inborn tendency toward one extreme or another we always have the potential at some point in life to feel good enough to learn about our emotional state. Whether we decide to work on that is another story. The biggest difference in how you handle a tough time, I believe, comes from how you prepare yourself when you’re not bottoming out. That brings us to the concept of privilege in this text. If a person has no time to ponder the world outside of sadness and overwhelming depression they can’t come to an enlightened conclusion. If you have that chance and you can think about what you think then count yourself lucky. Finally what of the crowd that would say my entire presupposition is false. Well I can’t argue the most base point of the philosophy that I am standing on. If you don’t believe that your own thought, and the use of your senses is the definition of reality for you then I bring my point forward only as a reminder in the hope that you will be at least curious about the topic. I for many years questioned reality in a backwards fashion. I recommended that consciousness wasn’t real because it couldn’t be proven or measured. I now find that measuring is just another idea we made up to make sense out of things our mind doesn’t naturally inform us on. Finally tell me what you think. Have you effected change by changing only yourself? What’s the biggest conspiracy of all? What’s really at the top of the ladder? Who is pulling all the strings. Most of the time the answer is no one. Nothing. There is no plan, there is no hoax and there is no ulterior motive. That’s not true all the time. After all the rich are rich and they plan to stay that way. Beyond that most conspiracy theories are rooted in a fear so deep people don’t acknowledge it. The fear that you aren’t important. It’s deep inside us all. The fear that we could be trivial, inconsequential. As well as the fear that no one is running anything. If we can identify that someone or a group is trying to corrupt us or take away what is ours we find purpose in the fact that we have something to defend. It proves we are real and valid members of society to think that others want to take away our validity. Most of the time it’s self perpetuated aggrandizing. The second fear, the idea that no one is running anything and we are making huge mistakes due to oversights and apathy, is bigger than us all. 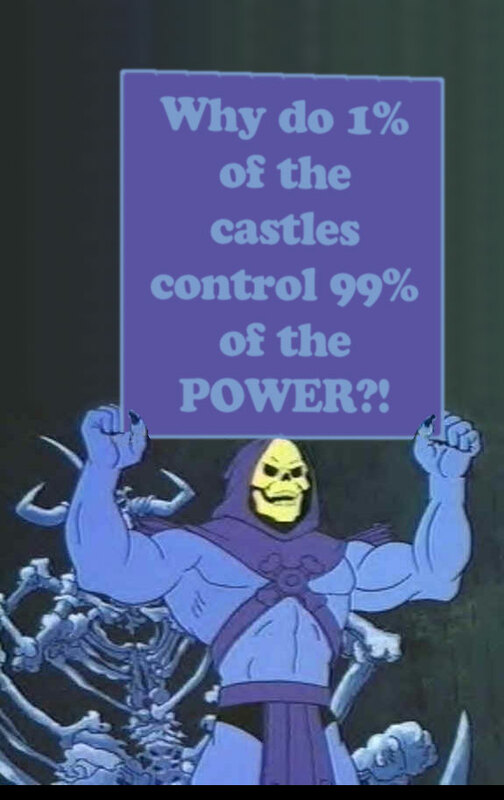 No one mentions it. No one rebuts anthers idea saying that our grand problems are our own to accept. We will create a scapegoat instead because honestly it’s too painful and difficult to face all that is wrong. We are each human beings that form a fabric of reality from our own existence on this earth and we all exist together in an undeniably linked way. The great ills we might identify are not an attack on us, they are us. ‘Evil’ is part of the reality of humans and every one of us is a part of problems and of solutions. So what? How do we address … reality? How do we take on greed and disparity and defending of what we find right? Well I don’t know. I didn’t start writing this because I have a solution for you. I want you to think. The next time your fear breeds hate, or more simply when you feel wronged, think about what you blame. I’m not asking you not to lay blame. That is a part of what we are and how we work. Don’t deny your human nature but do pause. Ask yourself why you think that. Whether you are right to blame, and whether you’ve contributed to the problem you’re experiencing in your life. For you or for someone else. If you manage websites you know how bad it feels to have someone tell you a site is not only down but it’s been that way for 2 hours … or days. There are solutions out there to monitor your sites uptime but many of them charge and are at best clunky. I’m going to share with you a simple php script I wrote to monitor the sites I maintain for my work and my personal sites. The great thing about being an adult is that you can do whatever you want all of the time. You can do it when you’re a kid too but it took me twenty something years to figure that out. This is my contribution to the world today. I am a computer programmer by trade and a long time computer user. I’ve had a Macintosh Performa 405, a Compaq Presario, a poorly build hand made computer, a Macbook Pro, a Dell Vostro 1000 laptop, a better built custom computer, a toshiba touchscreen tablet pc, 2 kinds of iphone and a sony vaio that I am writing on now. I’ve administrated several linux servers remotely and run both red hat and ubuntu on home computers (deciding finally it’s not worth the work to run linux at home). Suffice it to say I’ve used a lot of computers. In using dozens of different computers over the years I’ve noticed one thing, they are all computers. All of them do the same things. You can write documents, connect to networks, install programs, print, and browse the internet. None of this is particularly hard to figure out on a Mac but across the board I have seen IT departments that flatly give up when asked to do any of them using a non-windows computer. 10 years ago you could get away with acting like macs were a foriegn language and not supporting them but not today. Apple is the biggest company IN THE WORLD. It actually just beat oil in that competition. Every company is vying to get iPads pointed at their website or app and every consumer is either using or wishing they could afford a mac. I know it’s easy to administrate for a group of windows pcs over a network but when it’s time to do your job it doesn’t matter what’s easy it matters what needs to get done. Figure macs out and be ready to work on them or someone else will and your value will fade away. 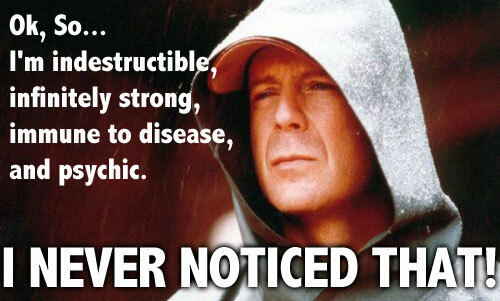 I just had one problem with the movie unbreakable.